jenn began practicing vinyasa yoga in cleveland, ohio to manage stress and be part of a like-minded community. she was immediately attracted to the asana, music, philosophy, and meditation. jenn moved to new york city in 2014 and visited many studios hoping to find a yoga home. she loved the asana sequencing, dharma talks, chanting, and meditation offered by talented teachers at the shala. 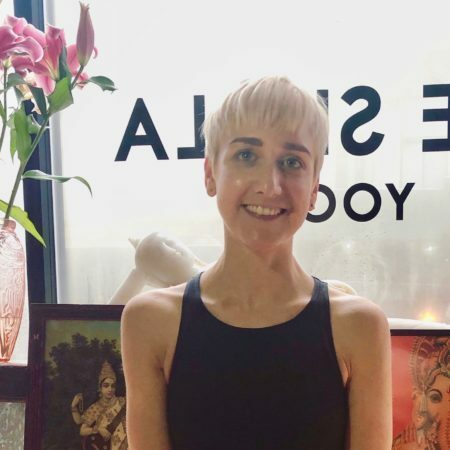 in 2016, she began researching yoga teacher training programs to deepen and develop her practice and learn more about the anatomy, proper alignment, history, and philosophy of yoga. jenn completed her 200 hour teaching certification at the shala in 2017. she is forever grateful to her teachers kristin leigh, barbara verrochi, and sherry russell, as well as many of the shala teachers who she continues to practice beside and learn from. jenn works full time as a paralegal so understands the busy new york city lifestyle. a mindful asana practice, breathing, and meditation have helped jenn create balance, calm, and strength that she hopes to also bring to her students. her classes are a mix of creative sequencing, mindful breathing, music, yoga philosophy, and meditation. jenn lives in brooklyn and loves reading, fashion, decorating her apartment, and spending time with her boyfriend and cat child, gatsby.